Before attending your first scientific conference, you’ll get a lot of feedback. Most of that commentary is about science, fittingly enough. “Be prepared to see at least 17 big wigs in your audience,” your advisor warns. “That graph is kinda nonsense,” your grad student practice audience frowns. “Will green and blue make it tough for color-blind people to see your slides?” your lone humanities friend wonders. If you’re lucky, your grad school experience is filled with well-meaning people who will provide invaluable advice on your science and prepare you better than any generic blog post could hope to do. That’s why today, I’m skipping the science and going straight for the superficial. To succeed at your first conference, you will absolutely need to log long hours getting your science in ship-shape. But beyond that, I have two pieces of advice: 1) Smile and 2) Dress Well. My lab + alumnae, (hopefully!) illustrating the two tenets of superficial conference-going. Photo from Ashley Smyth. I heard that eye roll! I’m serious here: conference preparation goes beyond science. That is obviously the most important part, far and away, and all the superficialities in the world won’t help if you aren’t up to speed on your field. But assuming you’ve done all that work, there are two ways you can make your conference a little more enjoyable. The first is simple- smile! Smile when you see the conference hall! Smile when you’re uploading your talk! Smile at the intimidating scientist asking you complicated questions about your research! I have no references to back me up here, but smiling will make you feel more relaxed, and I can speak from experience that being relaxed at conferences is not only nice, but necessary. 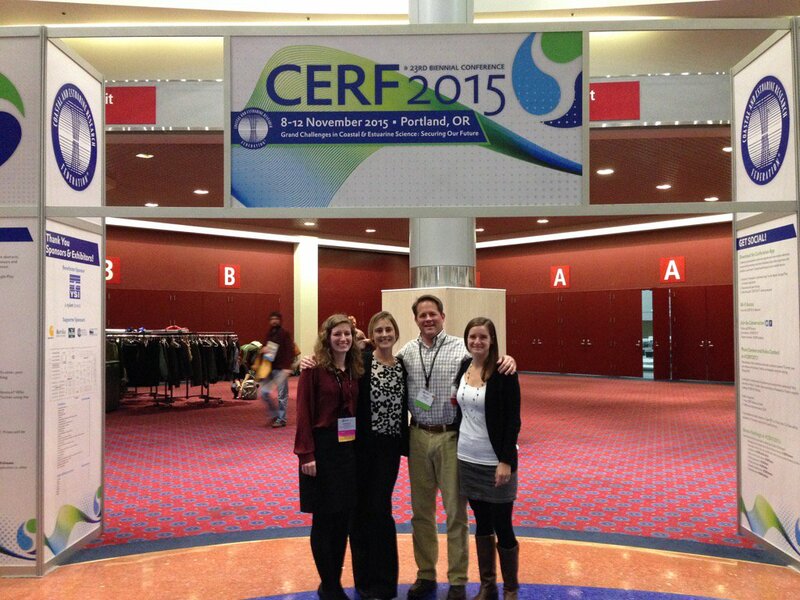 Last week, I attended my first big conference, the Coastal & Estuarine Research Federation (CERF) meeting in Portland, OR. On the first day, I was nervous and completely overwhelmed, to the point of calling my dad for motivation. (If smiling fails, call your dad.) There was no reason for me to be so on edge: CERF is pretty much the most encouraging, supportive conference I could imagine. But I probably missed out on some opportunities that first day because of jitters. As the conference continued, I relaxed, dusted off my confidence, and was just fine, albeit feeling a little foolish for having let my nerves get the best of me on day one. So as you roll up to that conference hall, the best thing you can do for yourself is lay down a good mental pep talk and plaster on a smile. Yeah, it’ll feel forced at the beginning, but you’ll seem approachable and really will begin to chill out. You’re ready for this, imposter syndrome be damned! There’s no point wasting all that preparation by second-guessing yourself when the event is underway. One thing that might make all that smiling a little easier? Feeling comfortable with your attire. Dressing for success is a trope for a reason, and you’ll feel more capable if you look the part. The problem is, dressing for academic conferences makes getting a PhD look like a cakewalk. Since fashion and academia are often treated as parallel lines, never to intersect, it can be awkward at best to even broach the subject of conference attire. I think there’s an implicit judgement that if you’re paying attention to clothing, you’re neglecting your work. That’s obviously true in the extreme, but women in particular may have more to lose by conceding authority by dressing down, making it a prudent career move to look put-together. I won’t even pretend to know about guy’s fashion (my little brother still laughs about the quickly-returned sweater I got him one Christmas), but I’ve spent significantly more time parsing the baffling world of women’s professional casual. And, like any good scientist, my best recommendation is to provide references! Sartorial Science features real live scientists, male and female, wearing attire other than lab coats. Tenure, She Wrote and My Laser Boyfriend have great insight and suggestions for conference dressing, and Dr. Kim Cobb from Georgia Tech has a terrific montage of well-dressed women at the 2012 AGU conference. If you’re more into fashion blogs, Cotton Cashmere Cat Hair has a helpful write-up on packing for a conference, and I am a huge fan of the now-defunct What Would a Nerd Wear. It all boils down to dressing in a way that’s comfortable and reflective of your own sense of style, plus. The plus is taking things a bit beyond what you’d normally throw on for a day in the lab: switching to a pencil skirt or button-up or whatever makes you feel a little more tailored. CERF attendees weren’t wearing suits, but I didn’t see any flip flops and khakis either. Everyone had put some consideration into their appearances, conveying a sense of respect for themselves and their audience. Some simple wardrobe prep helps ensure that when you’re actually at the conference, you can forget about what you’re wearing because it fits right in. Prepare for your first conference like a hard-nosed scientist, 100%. But after you’ve done the science, remember to take a breath, smile, and adjust your shirt just-so. You deserve to feel confident, and sometimes, being a smidge superficial is the best way to get there. Tags: academia, CERF, conferences, imposter syndrome, style. Bookmark the permalink.